We are about halfway through our weekly competition, and though we've had a good response we think this one has still got some distance to go. 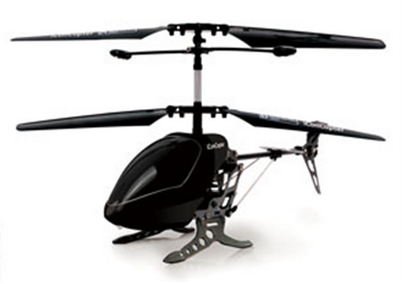 The prize this week is an iConheli remote control helicopter! It's a pretty great prize that would entertain people of all ages - plus, all you need to do is follow our twitter page and retweet the said tweet to enter. It really is that simple! Our helicopter competition is going to take some beating, the iConheli is a great bit of kit and perfect for all you gadget lovers. 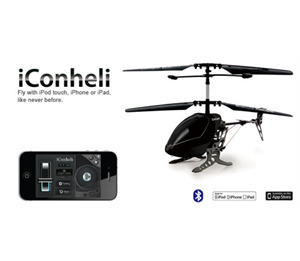 The iConheli is unlike your standard remote control helicopter as it is controlled by your iPhone (or other Apple device). The iConheli is sturdy but lightweight - this makes it really easy to pilot and gives it thrilling manoeuvrability! Gadget inspector loves their flying gadgets, and we think this helicopter competition is one of our best. You only have until Friday at 1pm to enter so you haven't got too long left. From a few clicks on twitter you could have this stunning black helicopter at your disposal! We hope our helicopter competition really takes off, and that you're there for the journey. From One Festival Competition To The Next! So we just announced the winner of our festival competition, congratulations to them. They are now the proud owners of a pair of Festival Feet; don't worry too much though as you can have a pair yourself for a small price. Festival Feet are an awesome alternative to wellingtons that just slip over your existing shoes and are then disposable afterwards. There are times when only wellington boots will do but we are British and optimistic so a pair of shoe covers will do just nicely. Plus, they are certainly a lot more stylish and will weigh you down less when moving your feet! In our competition we asked you to tweet us your favourite festival and we found the results interesting. Perhaps rather unsurprisingly Glastonbury came first - you guys must have really missed it last year (atleast the Olympics made up for it somewhat) and it is the king of festivals. The next most popular festival was V Festival by quite a way which certainly reflects the more mainstream tastes of some of you. All of the bigger names made up the rest of the list and it's clear you all know how to really do our festivals justice. If you are going to any of them this year then why not consider our Festival Feet - they are only the price of a pint at the main stage and your mother will approve of the protection they offer. If however you are really keen on winning stuff and missed out on our festival competition then we have some good news for you. We are running a competition every week on our social media sites; go directly to our competition page to see what you could win today! Festival Competition - What's your Favourite Festival? Festival season is coming up again (it only feels like a few weeks since the last one!) and if you can't wait to pitch your tent and head for the main stage, our latest gadget competition is sure to be right up your street. We're giving away two pairs of Festival Feet, and entering our #festivalcomp couldn't be easier! All you have to do is hop over to Gadget Inspector's Twitter page and let us know what your favourite festival is. It could be something close to home, like Glastonbury, or something on the other side of the world; it could be a massive, sells-out-in-ten-minutes sort of event, or just something your best friend puts on in his back garden. No matter how big or small your favourite fest is, we want to hear about it! The competition closes at 1pm on the 10th of May. That gives you the best part of a week to enter - give us a tweet today, and you could win a pair of Festival Feet for your next big weekend! Gadget Competition - Win an iPhone RC Helicopter! The iConheli is right on the cutting-edge of RC innovation. This sleek little chopper does away with clunky remote control handsets and instead hands the reins over to your iPhone - how cool is that? You can even use your iPad or iPod Touch if you don't have an iPhone! But the best news of all is that you could get your hands on one of these iPhone RC helicopters for absolutely nothing. We're running a competition over on the Gadget Inspector Facebook page at the moment, and to be in with a chance of winning, all you have to do is 'Like' our page and share this post. That's really all there is to it! Spring is here, summer's just around the corner, and now is the time to acquire an awesome RC chopper and take it out for a test-fly. We're announcing our competition winner at 1pm on Friday 03/05/13, but don't worry if you're not the lucky one - this excellent remote control chopper will still be available to buy, and at just £25.99 you'd be crazy not to purchase one!